What do anchors say when they don't know they are on camera.... just watch! "Celebrities" say the darnedest things when they think the camera isn't rolling! Jimmy's response is better than Sarah's video... hopefully this spawns new ones. This stuff is hysterical. The best part is that they created the exact shots from the 2D animated film. Many famous stars have been photographed lately by Anne Leibovitz, posing as famous and beloved Disney characters. 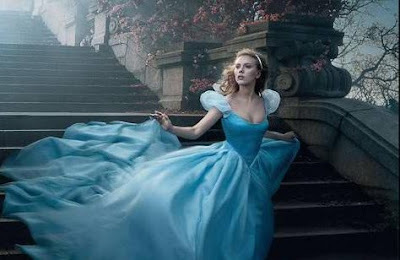 Celebrities such as David Beckham as Prince Phillip, Scarlett Johannson as Cinderella, and Rachel Weiss as Snow White. The photos are worth checking out. Disney's Pirates of the Caribbean franchise has been rightfully praised for dazzling character animation, but its CG cast isn't the only advanced animation created for Pirates by San Francisco-based Industrial Light & Magic (ILM). The third film in the series, Pirates of the Caribbean: At World's End, also required sophisticated digital simulations of the briny deep — especially during a 15-minute sea battle in which an ocean maelstrom plays a pivotal part. As two ships sail towards each other, lightning strikes and swelling seas signal an ominous storm. In the water between the ships, the ocean swirls dangerously, crashing against the vessels as the battle plays out. Verbinski supplied a previz created in Autodesk Maya, which he wanted ILM to match. Arnesson initially hoped they could avoid running computer-intensive simulations. “If we could get away with not doing sims, we wanted to. Doing work like this is about speed,” Arnesson says. But tests showed otherwise. “We knew that we'd have to do a hero simulation, where you see the CG ships and the maelstrom interacting at the waterline, and see the splashes caused by the ships moving up and down in the water,” Arnesson says. “Our idea was to leverage the technologies we'd used on Poseidon — our fluid-dynamics engine and particle-simulation engine. “Pirates required one thing that Poseidon didn't have, which was a stormy sea with breaking waves and lots of spray. If you want a stormy sea, you have to run the fluid simulation up to the point where the waves start to break.” Simulating the maelstrom was complicated by the fact that the water had to flow at different speeds as the ships sailed in and out of it. The hero simulation generated data that ILM's team could then use to spawn secondary particle simulations. ILM's inhouse particle-simulation engine runs in parallel with the fluid-dynamics engine, and the two engines can interact, according to Arnesson. “We got the level set of the ocean surface spinning around,” he says. “Then we got two different particle sets that had the velocity of how the water was spinning around. We used that to emit splash particles. Basically when a wave breaks, it emits splash particles. We wanted to have even finer particle sims for spray and mist. So there were sequential simulations, going from chunky particles to smaller and smaller ones. To get more detail in the finer particles, we jittered them so we got finer resolution of the droplets. All of those passes had separations in them, so there were multitudes of layers to deal with when these elements were composited in Apple Shake. Having multiple channels of reflections and foam fractals created a lot of work for the compositors, according to Arnesson. “But it was crucial to be able to combine different sub-renders, so that if something didn't work, we had some flexibility to fix it,” he says. This is an interesting talk by J.J. Abrams about the concept of confusion and withholding information being a very good way to capture audiences. My friend and colleague Adam Ely has this posted already... but for those of you who don't know Adam's blog, watch the video below. More videos about new and upcoming ideas and technology can be found on TED here. Guillermo del Toro is in talks to direct back-to-back installments of J.R.R. Tolkien's "The Hobbit" for New Line and MGM says The Hollywood Reporter.